What would you do, ask the experts? A few days ago I blogged about the Adrian Flux Insurance Group with whom I am having some challenges. Adrian Flux’s reaction was to comment on my blog using a FAKE name from a FAKE company they use within their social media out reach. 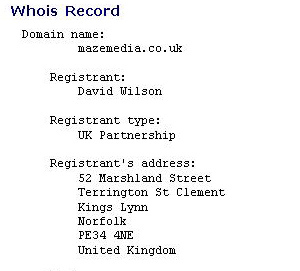 Unfortunately for Adrian Flux the “Whois” records go back to registration to their Marketing Manager David Wilson and the domain is registered to their company address. I blogged it. This turned a customer dissatisfaction issue into a Social Media Disaster issue. It makes me more annoyed with their treatment. It shows up their shadowy practices. It reveals their un-trustworthy communication practices. The crazy thing is that I have already had direct contact with them and David Wilson, I am a customer. They know who I am. Now even if I was unjustified in my consumer complaint their shady method of response was disastrous. Now my personal involvement aside, no really forget that. This is much more interesting. I am interested to know what you would do if this happened to you and how you would see to resolve it? Do you, as a business, use social media monitoring tools to spot these things, such as Google Alerts, sm2, Radian6, Visible Technologies , Buzzlogic , TNS Cymfony, Nielsen , Trackur, Reputation Defender, Sentiment Metrics or PopularMedia? 1 Contact your customer with your real name as a real person, preferably on the phone. 2 Try to resolve the issue. 3 Try to turn the situation around to make the customer an advocate of your company. What would you do to avoid a social media disaster such as this? Good example of how tools to identify conversations about brand do not always result in the best engagement. One can only automate response to a degree. The human element, especially in customer service, is essential. Thank you for including us in your list of social media monitoring tools. to do in their place? Ken If you have already had correspondence why hide? Seems illegitimate, to me and others who have responded by RT ing.